Google has been busily making great changes to Classroom, most of which have been additions to the Android or iOS Classroom apps. I read on the Google Classroom blog today, that a new feature had been added to the “create a question” option. 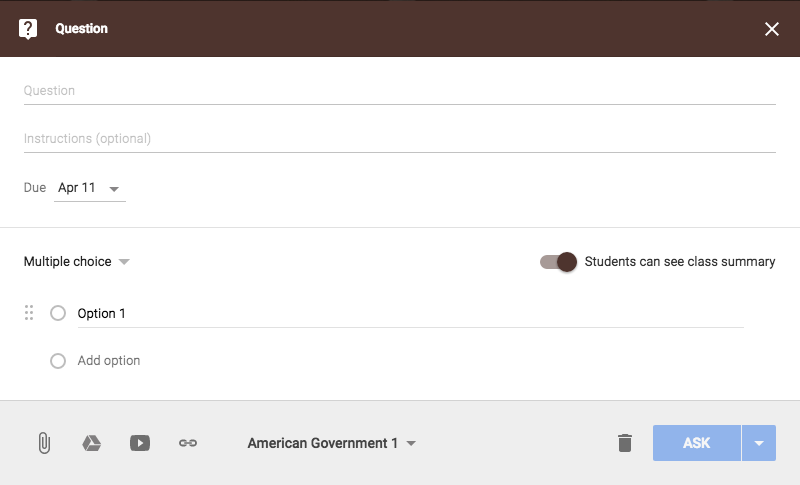 Teachers can now poll their students with a multiple choice question without having to create a Google Form. As I normally do, I tried the new option with my classes today. 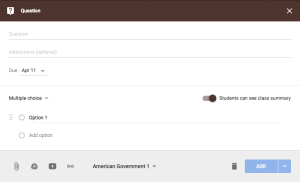 I was able to quickly create the question and view student data instantaneously. The polling feature reminds me of one of my favorite features of Geddit, which sadly shut down in July of 2015. The ability to quickly ask a question and receive student feedback…instant formative assessment. To prevent students from viewing class responses, simply slide the button! I also have the option of whether or not to allow students to view entire class results. That, my friends, is a great feature. Students will most likely feel free to express their content understanding if they know their classmates won’t be able to see their responses. Teachers still have the option to pose short answer questions to their students, and can choose to allow students to edit their original responses (I normally don’t turn on this feature) and reply to each other. This feature is getting closer to a discussion board that I would create on my WONDERFUL LMS, Schoology, but it’s not there, yet. Read this post about how I use Schoology AND Google Classroom with my students! How can you use this new feature in the classroom? Exit tickets! Bellringers! Post-instructional video questions! The list goes on and on! I’m extremely excited to see what else Google has planned for Classroom! P.S. Have you signed up for the Teaching with Technology mailing list, yet?! Join and get a FREEBIE in your email!